Front row (left to right): 1. Bill Scott, 2. Larry Farnam, 3. Gary Richardson, 4. Billy Whisler, 5. David Gamble, 6. Don Crist, 7. Luther Reese, 8. Ernie Chase. Second row: 1. Carol Perry, 2. Barbara Nissen, 3. Charlotte Plank, 4. Al Tirnetta, 5. Rosemary Armstrong, 6. Sylvia Brooks, 7. Sondra Rogers, 8. Laurel Mourterot, 9. Sheila Morgan. Third row: 1. Alice Bubnar, 2. Ron Hicks, 3. Judy Perry, 4. Katherine Bells, 5. Joyce Yarbrough, 6. Danny Grieve, 7. Willis Hobbs. Fourth row: 1. Philip Silva, 2. Bill Wright, 3. Kent Stole, 4. Ralph Laughlin, 5. Lewis Scribner, 6. Alex Segundo, 7. David Young. Fifth row: 1. unidentified, 2. Sharon McCoy, 3. Julie Crist, 4. Pat Rettig, 5. Lenore Farnam, 6. Mary Claire Ayen, 7. Bill Mustain, 8. Archie Chase. Credits: Original photograph by Elliott H. Dopking. From the collection of Alice (Bubnar) Blair. Scanned by Alice Blair. 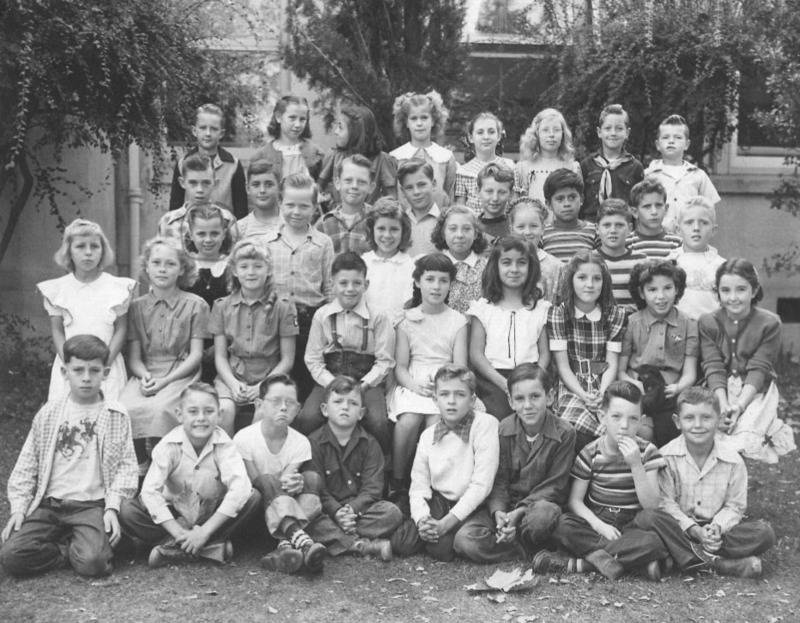 To find other pictures from Livermore Elementary School (in the building now known as Fifth Street School) in the archive, see Livermore class pictures listed by school. And if you have any pictures from the Livermore Schools that you would like to share, please submit them to the Archive.